Find out more information about our Portland Piano Repair services on our new piano repair web site. Repairing or Rebuilding Your Piano? 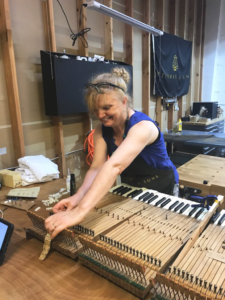 Michelle’s Piano Company has two restoration locations in Portland, Oregon. We have a large and dedicated piano servicing staff who specialize in piano repair, finishing and rebuilding. We do in-home tuning and pitch raising. Tuning a piano yourself is not a simple process. Piano Tuning is a learned skill. Read more about our Portland piano tuning on our Portland piano repair web site. Regulation, hammer voicing/ replacement, and repair sticking keys. We employ finish specialists. Make your piano shine again- like it once had. We offer full cabinet refinishing and restoration. 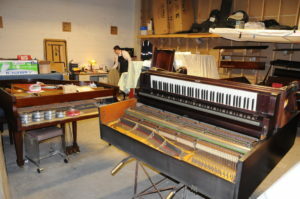 See a more detailed description of all the piano repair we offer at our Portland Piano Repair web site. Repair or replace wheels and install moving dollies. Clean, recondition and restore your piano to original factory conditiont. Repair or replace your damaged key tops with new synthetic materials or vintage Ivory. Since we move, refinish, rebuild/repair and sell pianos, we offer Special Package Prices. View our current Piano Storage Packages and Free Piano Services pages for more information. For a quote call 503-295-1180 and or email: info@michellespiano.com. Let our experts transform and restore your instrument into a treasured heirloom.